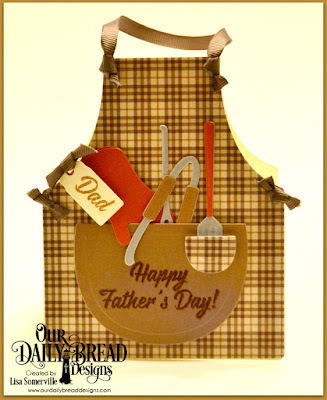 Thanks for stopping by, today I'm sharing a fun Apron Card created with Our Daily Bread Designs papers, stamps and custom dies! The sentiments are from the new Grill Master stamp set, and I've paired the stamp set with the new Barbeque Tools die set, Apron and Tools and Mini Tags die sets to create a fun Father's Day card. Using the Apron die, I placed my Vanilla card stock with the fold line just below the cut line of the die so that I would have an Apron card that opened. Then I cut the Apron again from the Ephemera Essentials Paper Collection and adhered the paper to the Apron base card. The Barbeque Tools were die cut from Silver and colored card stock, so that I could add colored handles to the tools. The potholder was die cut and embossed from Cherry card stock.